(5 stars) It just plain works! It was as simple as USB is supposed to be. Plug it in, watch it go. I got one to connect my mini Display Port Apple Cinema Display... It works fine!. I got this product as I am always on the go from office to office either doing presentations or just doing work at the location. 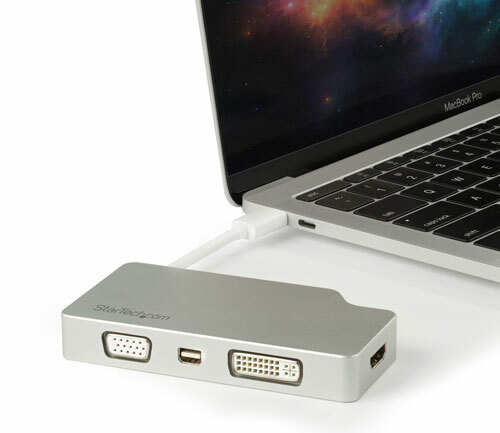 This unit lets me plug my laptop into an existing monitor to do my work on a bigger screen or to a TV to do a presentation. 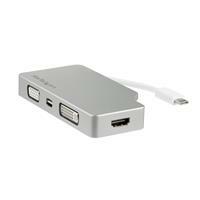 Great device to have and easy to fit into a laptop bag because of it's pocket size. The unit is solid and the silver finish case is strong enough to protect it from the bumping it will encounter while being in a laptop bag. The USB C cable tucks away into the side for easy storage. Nice addition to my laptop bag. Small, sturdy, and one piece (partial "pro" there). Just connected it up out of the box and I had full resolution on my 4k monitor--provided the computer can drive that of course. The multiple output ports are fantastic when travelling. I need only worry about MY computer, and the adapter has the rest covered. I like how the cable wraps around and tucks in. Cons: Just one partial con, the interface cable is both short and non-removable. That's made it rough a couple times, but not a show-stopper. Other Thoughts: I received this product in exchange for an unbiased review. But frankly, I'd have done a review of this device anyway as it's always with me now. 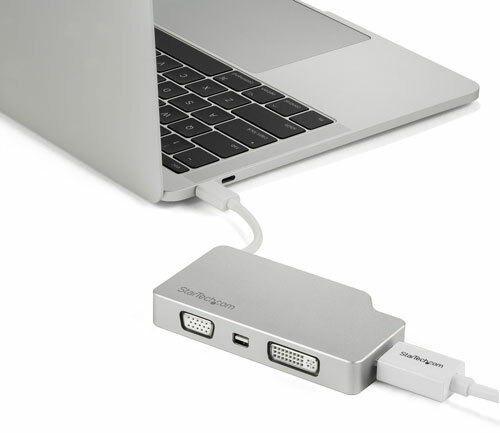 This display adapter has enough flexibility to support just about any current display connection requirements. Particularly if you're watching content from an Apple product to a 4K television, you'll find the size and the ease of switching between, say, 4K and HDMI connections simple and easy to manage. 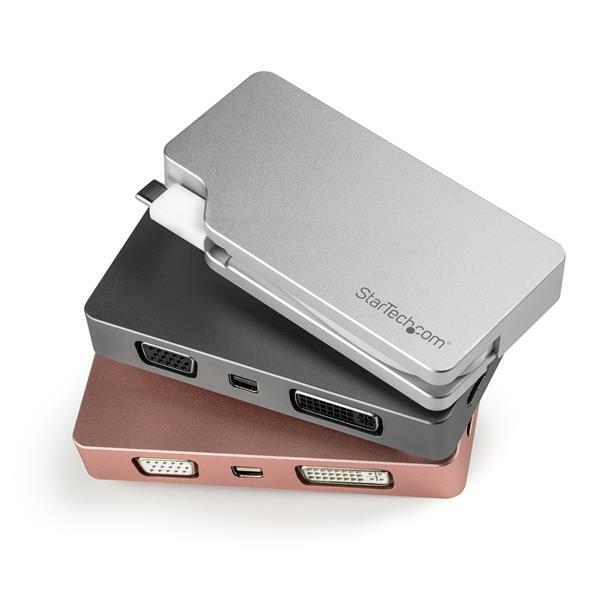 The unit itself is quite heavy and the USB-C connector is manufactured from rugged cabling that should last well beyond the 2 year warranty period. 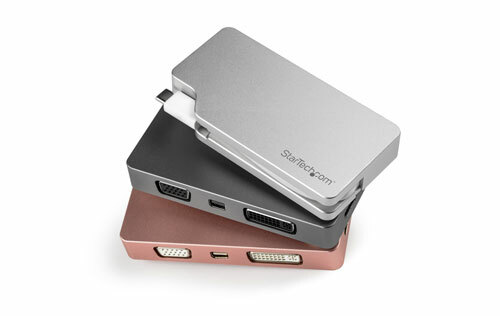 The housing of the unit is polished aluminum and the USB-C connector folds in and and holds tight. I tested each of the connectors for fit and each one held tightly without having to be screwed in. Signal quality through the tested ports were good. Packaging was easy to break down for recycling purposes. If travelling or conducting presentations at customers / clients offices we have all had the issue of having the right cable / adapter for a big screen display. 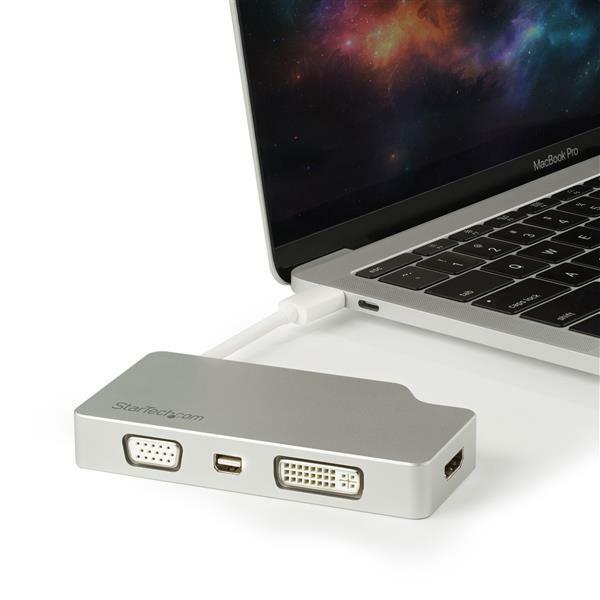 With the 4-in-1 travel A/V adapter we now have the option of outputting to a mini DisplayPort, VGA, DVI or HDMI while using a USB-C 4K connection to laptop, tablet, etc. I have one of these in each boardroom to avoid confusion and last minute scrambles. This is a rugged device and should be added to the toolkit of any road warrior! I received this product in exchange for an unbiased review. 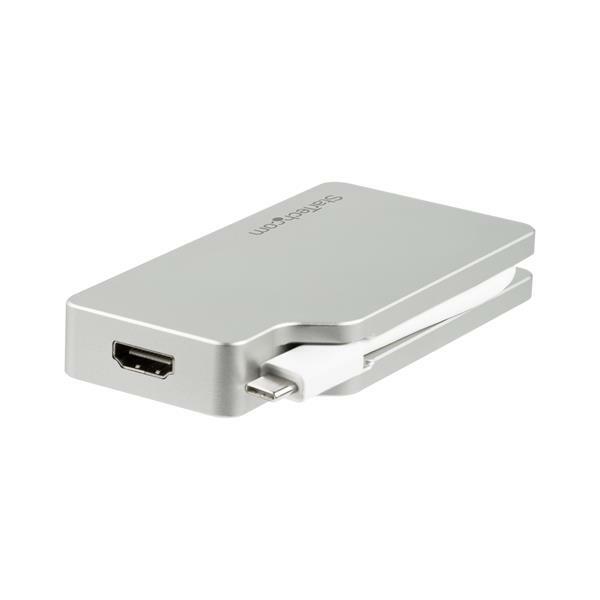 (5 stars) Portable Presentation powerhouse! I have been in the technology business for over 35 years and for the past 20+ years I have been asked to provide unbiased reviews of various products from both the AV and IT world. In review of this product I found it to be very stylish with a rugged design perfect for travel with it's brushed aluminum exterior. I connected this to my 4K LED display from my laptop and there was no tearing or pixalization when watching a 4K stream at 25'. I like the variety of outputs on this unit, which make it perfect for the business road warrior. In the box: -Aluminum Travel A/V Adapter: 4-in-1 USB-C to VGA, DVI, HDMI or mDP - 4K In summation, solid product, stylish, rugged and easy to use. I received this product in exchange for an unbiased review. 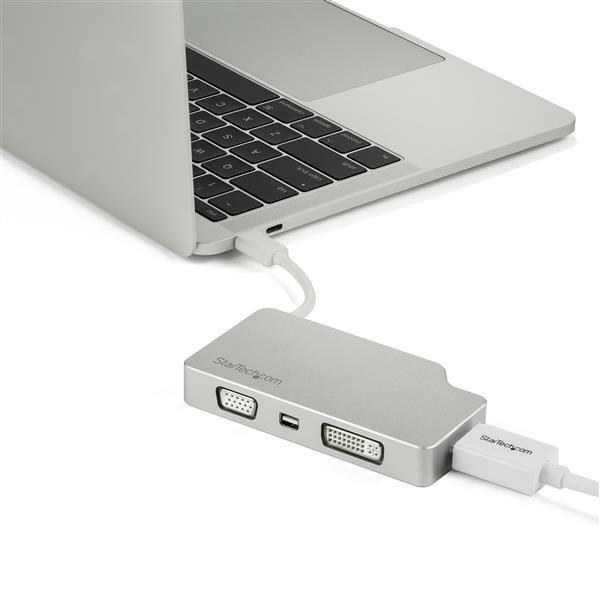 This device pretty much covers any external display connection you need for a USB-C device like my MacBook Pro. This is a very nice compact device that even allows you to lock in the USB-C cable on the side to make it easy to travel with. 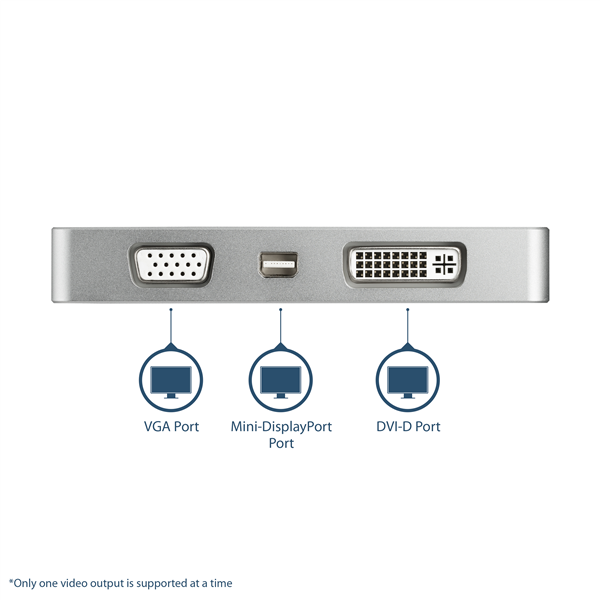 I tested out the VGA, Display Port and DVI ports on the same monitor and found that with each connect the video quality improved. I connected the HDMI port to a 50" LED TV and the picture quality was just as good as my laptop screen. 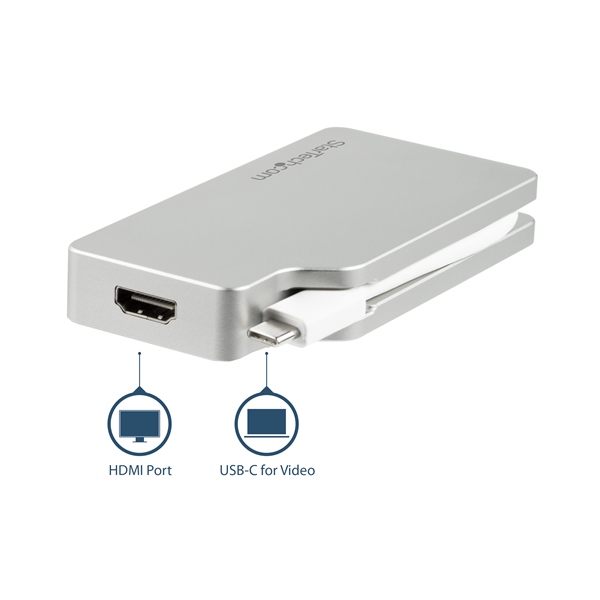 The device only allows for one video connection at a time but overall it is a great find for travel. It is compact and functional.